"Genevieve did not want to fail the queen. She closed her eyes, stuck her hands in the bucket, and pulled out a scoop of wet, gloppy earth. Nervously, she shook her hands, and the mud fell to the ground, splattering everywhere. "Not bad!" said Bloom with a smile. Genevieve laughed and brushed the splatters off her feet." Bloom is the keeper of the castle in a glass kingdom. She is not the magic fairy you would expect to find there. Instead she is constantly dirty, loves mud, and plods through life with that lovely muck stuck to her feet and trailing behind her. Residents of the realm are more disgusted by the dirt than they are pleased with the fairy's magic. 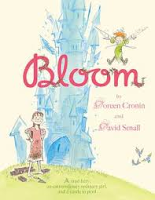 Fed up with the constant reprimands, Bloom takes her leave and is off to find happiness in the forest. Everyone seems mightily pleased with her decision - until the kingdom begins to fall down around them and the King remembers that there was once a creature who had the power to keep it in repair. He sets off to find Bloom. When Bloom offers mud as the solution to the problems faced, the king rides back to his realm in disgust. The queen's quest to lure Bloom back is equally ineffective. The royals decide to send an 'ordinary' girl to lure Bloom back. Genevieve is of small stature with a very quiet voice, the polar opposite of Bloom. She won't let her rulers down. Off she heads to the forest to find the fairy. Bloom's solution remains the same - mud! Genevieve is confused. Bloom is interested in the girl and asks about her work in the castle. When told Genevieve cares only for the queen's crystal spoon, Bloom is aghast. "Tell them there is no such thing as an ordinary girl," said Bloom." David Small's splendid watercolor and ink images bring the kingdom to energetic life. The warm colors and detailed drawings herald a world that is sure to awe those who share this book. Expressive, magical, and witty to boot, they are a perfect match to Ms. Cronin's thoughtful take on the fairy tale framework and the magic that comes from hard work and a desire to learn. "We found Harm standing by the steps, shivering in his sweater and moth-bitten scarf. "You look like you're freezing," I told him. "Coolest guy in middle school," he said, his breath steaming in the cold. "Who am I kidding? I'm freezing my begonias off. Let's go inside." Lately Harm's using flower names as off-color words - a trick Miss Lana taught him. He says it keeps his grandfather, Mr. Red, off his back." If Mo, Dale, Harm and the folks from Tupelo Landing, North Carolina, are new to you, you are in for a remarkable reading experience. But, don't start here. Instead, get yourself to the library or bookstore and find the first two books of this outstanding series, Three Times Lucky and The Ghosts of Tupelo Landing. You might decide that you want all three on your 'keepers' shelf as I do! Reading this book without reading the first two is absolutely OK! But - it is a much more satisfying experience to read all three! That way you will get to KNOW a very special cast of characters who worry about each other, and work together to make their world a much better place. 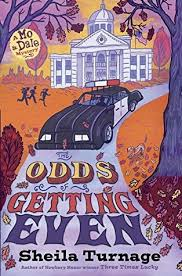 The setting is full of charm, and the writing is terrifically funny and original. It's another mystery, attractive to fans and sure to garner many more. Mo and Dale are at the center of the action in this plot-driven, action filled adventure. Dale's older brother Lavender is in danger and the Desperado Detective Agency is out to find the culprit threatening him. Their father Macon in on trial for his role in a crime committed in the second book of the series. When he escapes, he is blamed for robberies and even the attempted murder of his older son. But, who is the real criminal? Will Mo, Dale and Harm use the evidence presented and their previous experience to unravel the mystery and capture the culprit to blame? Once started, you will be loathe to put the book down. You want to just keep rolling along as the suspense mounts and the three follow all leads to solve yet another mystery in Tupelo Landing. Mo's voice is as strong and spirited as we have come to expect. I have marked so many pages for quotes that I am tempted to share them ALL with you. But, you would do better to read it yourself and enjoy the ride. Full of fun and perfect for a family readaloud, this series pleases with its intrigue, its love of family, and its heart. brave the scary things for you. 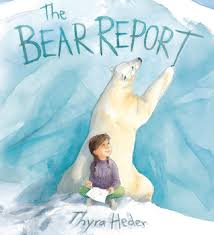 This is another of the books that I shared when I visited Val's class last week. 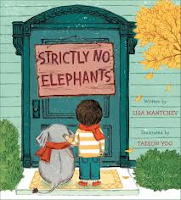 As I read, I was also able to read the faces around me - concerned and sympathetic to the plight of the young boy and his elephant as seen on the cover. Uplifting and oh, so satisfying to a class of children who want nothing more than to treat their classmates with love and respect ... a lesson so clearly taught by a loving and respectful teacher. What a blessing! 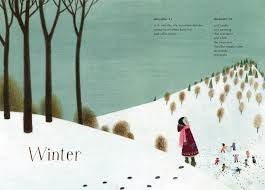 Taeeun Yoo's quiet linoleum block prints are a soft and charming accompaniment to this debut picture book. "Beyond exhausted, for her fifth trip across her besieged terrain, the cattle dog could at least run in the path the herd had forged. She found the three people in the middle of the corridor; they were still far from the farmhouse. And they were sitting on the ground, the small one balled up in the man's arms. She ran straight past the family, turned quickly, and barked at their backs." One of the great things that happened while I was waiting for a recent doctor's appointment was the chance to read this, at times terrifying, new novel for middle grade readers. 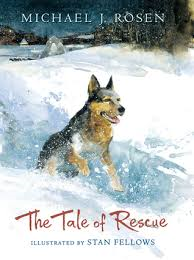 I paid no attention to the people around me because I was totally taken by a story that is sure to win the hearts of all readers who love tales about courageous and smart dogs. It is a story of a dog and a boy, and the circumstances that connect them. When a family from Florida, on holiday in the Appalachian foothills, are caught in a blizzard while hiking from their cabin to a nearby lodge, they become disoriented in the blinding snow. We don't know who they are - we do know they are a mother, a father, and their 10-year-old son. As they struggle to stay warm and alive, they do not know that a cattle dog from a nearby farm has heard their whistle for help. It turns out that the dog is trying to keep them awake. Despite her fatigue, she is determined to get them moving toward the farm. It is not the only attempt she makes to save them. She returns home for help. When she cannot rouse the farmer to action, she herds her cows to forge a path from the farm to the family and brings them home to warmth and safety. The story might end there, with the farmer not knowing the names of the people who spend time in his house, and the family not knowing the name of the dog who came to their rescue. It does not. In an epilogue the boy, now graduated from high school, returns to the area to try to find the farmer and his heeler and learn the rest of their story. The fine writing is accompanied by splendid, light-filled watercolor artwork. The language is lovely and dramatic, the pace perfect. This would be a wonderful readaloud for any middle grade classroom. I think you will really enjoy it. "For as long as I can remember I have loved climbing trees. Even though I am usually afraid of heights, for some reason I always feel quite safe when I'm sitting up in the branches of a tree. My old trees are a lot of fun to climb, especially in the fall when they are full of apples. I never get tired of climbing up onto the branches ... "
As I read in my local paper yesterday about the destruction of a stand of trees on a city-owned golf course, I could not help but think about this recently read book which informs those who read it about the real importance of trees in helping to sustain our planet. They should never be cut down without careful thought, and certainly not in a effort to save money! In the newest addition to the Orca Footprints series, Nikki Tate explores the huge importance that trees have in our lives and the life of our planet. The four chapters are named for Earth's elements - earth, air, fire and water. They explain how trees provide food, shade, fuel, clean our air and enhance the landscape. Our lives and the way they have developed have much to do with the interactions felt between trees and the earth's inhabitants. 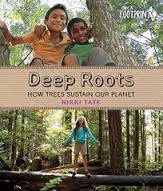 Ms. Tate's book is a terrific look at the role played by trees and assures that readers gain knowledge and find personal interests that might begin here, and then branch out to include richer information from other sources. The design is as pleasing as it has been in other books from the series, offering well-captioned photos, a combination of archival, personal and found one that give her readers a close look at the benefits of protecting our trees and forests. The Try This sidebars encourage kids to get outside and have a close look at the world they inhabit, taking time to truly appreciate its beauty and wonder. There is great diversity to be found wherever we live. She also includes a series of Forest Fact boxes and adds I Love Trees insets to share personal anecdotes from her own life. "Planting a tree is an important way to commemorate an important life event - like the birth of a child. When my mother was a baby, her family planted a lilac tree outside her grandmother's house in Germany. For her whole life, my mom loved lilac trees, and to this day I associate the smell of lilac blossoms in spring with warm memories of my mother." A list of resources and websites, a glossary and index follow the text and are useful for those wanting to know more. "Slowly, Earl changed from a tight ball of prickles into a flattish prickly thing with a face. "The truth is that I'm a talking hairbrush." 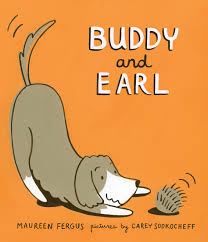 Buddy was almost positive that Earl was not a talking hairbrush. Before he could give voice to his doubts, however, Earl said, "And what are you, Buddy? Wait! Don't tell me. Let me guess." Told to leave the box alone is his undoing. Buddy cannot hide his snoopy nature. Soon, he is right up next to that box, intent on discovering what is inside. He is definitely intrigued by what he finds - something he has never seen in his life! Almost ready to give it a lick, 'the thing' moves and after introductions, Buddy asks Earl to describe himself. And that's where the fun begins for young listeners! First he says he is a race car. Buddy pooh-poohs that idea quickly, noting that Earl doesn't have a steering wheel or wheels, both important features of said race car. Earl is nothing, if not imaginative after suggesting that he is a giraffe, a sea urchin, and a talking toothbrush. None is an acceptable description for Buddy. 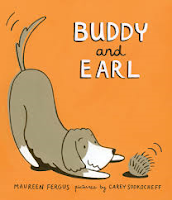 Earl then turns the table in an effort to discover what Buddy is. Not a skyscraper, or a rhinoceros, or a mouse, he finally shares an idea that Buddy finds intriguing and full of adventure. Off they go! When Mom walks in on them, she is not pleased with the mess made in the living room. Buddy is in big trouble now! It is s only when Mom leaves that Buddy shares what he has discovered about Earl's real identity. The conversation between the two leads those who share this lovely book to understand a growing friendship, and the lack of importance for labels. Humor is abundant, and will elicit quiet giggles and perhaps even loud guffaws at the initial misunderstandings. In the end, all that matters is that a friendship has been established in this first book of a new series. Carey Sookocheff chooses a simple, appealing style and a gentle palette of color for the perfect artwork to accompany this welcome tale of friendship and adventure. I was lucky enough to read this book in a Grade 1/2 class just before they left for their spring break on Thursday. It's my favorite thing to do these days - visit classrooms and share books that I love. Now, this is a class that loves books! Their teacher (my dear friend Val) reads to them every day, they talk about books all the time, and they love to read to each other. It's a dreamy class to visit. They are very appreciative and connected to what is happening on every page. Since it took me a long time to get my hands on this book (thanks to Winston for sending it along to me) and I love it, I thought it would be a perfect start for our book sharing. And, I was right! They were impressed with the color and lines on the cover and equally enamored of the beautiful designs on the endpapers. 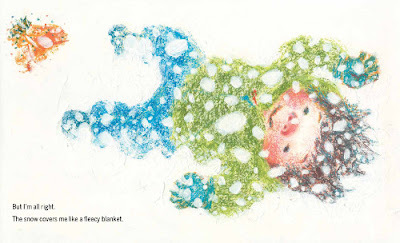 We talked about how lovely it would be to use Ms. Paschkis' designs as borders on book pages or art projects. 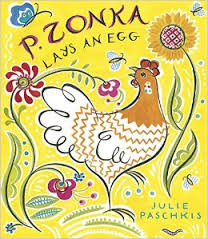 After listening to the other chickens and their pleas for her to lay an egg, P. Zonka sits down to try and lay the much wished-for egg. EUREKA! The kids were dazzled, and you will be, too. As she explains in a final note, the art in this gorgeous book is inspired by pysanky, eggs decorated by many throughout the world. The book reads like a folktale, and the detailed colorful pages are directly related to the designs and color found in the traditional Ukrainian art form. "In the distance, a shadow broke over the crest of a wave. Izzy strained to make it out. It disappeared into the next trough, then re-appeared a moment later, riding the next crest. In the instant before it vanished back into the gap between the waves, Izzy knew exactly what – or rather who – it was. Her stomach lurched. Sweat formed beads on her forehead. A knot lodged in her throat ... "
The results of a flu epidemic in Thompson, MB have a profound effect on the community. Most people have died. The survivors are bent on looting and doing their best to ensure that they make it, no matter the consequences. The gangs that roam the city are dangerous and threatening, and things are only getting worse. Izzy survives an attack by one of the roving gangs. In doing so, she loses touch with her older sister Angie and must depend on a former neighbor to take her to a safe place. Rick is a survivalist, a parental figure and Izzy is thankful for his help, until she realizes that he is controlling and vicious, bent on making Izzy his slave both practically and sexually. The epidemic has also affected Jake and his family. They are awaiting the arrival of a bush plane to take them home following a summer stay in a remote cabin. The plane does not return. In the meantime, an infected cut makes Jake's mother very sick and forces his father to canoe out for help, leaving Jake to care for his mother and grandfather. Both die before Jake's father returns. With little hope that he can make it alone, and having learned survival skills from his father and grandfather, Jake sets out for Laroque. After long days on his own, he is excited to find his father's canoe near the cabin where Rick and Izzy are living - until he sees Rick beating Izzy and no sign of his father. Watching carefully, he takes an opportunity to steal the canoe, rescue Izzy and set off with Rick close on their heels. They are able to steer clear of him for a time. The chase seems endless and is terrifying. Eventually, Rick catches up to them. In the midst of a frightening altercation, Izzy uses her slingshot skills to end the pursuit, and Rick's life. The characters are complex and compelling. Izzy is resourceful, strong and determined to make her own way to safety. She has difficulty trusting Jake, after all that she has lost. Jake understands her reluctance to trust him and is patient as he, too, deals with great loss. Rick inadvertently teaches Izzy many of the skills she will need for surviving in the bush. The northern Manitoba wilderness is carefully drawn to explore the dangers inherent in trying to find your way in such an unbelievably harsh environment. 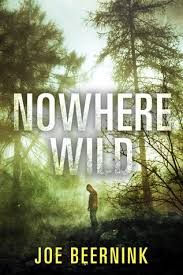 Dramatic and with a feeling of unease at every turn, this debut novel is sure to attract many teen readers with its story of love, loss, terror and ultimately, survival. "Wind and dust and tears fill my eyes. I scrub at them with my sleeve and run home. Past people on their way to work. Past Mother's garden. Inside our room, I drop to the floor at Grandfather's feet. I wrap my arms around his legs and try to speak. But my throat is still closed. I want to tell him I am sorry. I want to ask him to forgive me. But no words come out." Manami and her grandfather love to walk along the shores of Bainbridge Island in the mornings before she goes to school. They love the sand, the saltwater, the sound of the ocean. Grandfather's dog Yujiin accompanies them as they explore. The two take note of the warships and soldiers nearby, and Grandfather tries to explain that the soldiers are as fearful as the islanders. Since the bombing at Pearl Harbor they are not sure that the Japanese can be trusted. There is talk at school and many rumors about why they are there. Still, Manami is surprised when her teacher tells Manami and her Japanese American friends that they will no longer be attending school. When she arrives home with questions about these recent events, her parents try to protect her from the inevitable. All people of Japanese descent will be gathered together and forced to move to a 'prisoner-camp'. The family knows little about their destination. Grandfather arranges for a friend to care for Yujiin. Manami cannot face leaving him behind, so she hides him in her coat. When the dog is discovered, he is taken away and the family is left to wonder what might happen to him. It breaks her heart. Her guilt renders her mute. Their arrival at the camp only makes it worse - fear of life there and the endless dust clog her already wordless throat. As the family tries to make a home in their single room in one of the barracks, Manami continues to worry about what she has done. Her parents find work to keep them busy and make the days easier to bear, her brother Ron returns from college to join the family and teach in the camp. She and her friend Kimmi are in the same class at school with Miss Rosalie. Her teacher gives her paper and pencils to use at home. Using this gift, she sends 'paper wishes' to Yujiin, in hopes that he might find the family again. 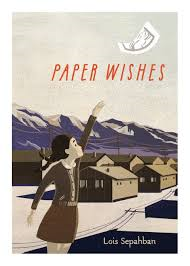 Using Manami's first person voice to tell this powerful story is exactly the right choice - the young girl is able to bring focus to the painful impact that government wartime policies had on innocent Japanese American families. The author's sensitive depiction of the suffering, injustice and fear through Manami's eyes is also hopeful at times - when her mother's garden grows despite the harsh conditions, in quiet moments between Manami and her grandfather, and when she finally finds her voice again. It is a powerful debut novel. An author's note provides additional information on early Japanese immigrant history and the internment camps that detained them during the war. The pain of their interment is still deeply felt for themselves and their descendants. This is an important story to tell, and it is told eloquently. "Then, inside Flea's favorite store, he saw a woman drop a giant piece of salami smack onto the floor. Flea pounced and snatched the salami before the Man with the Broom could even chase him out (an event that was both unusual and delicious). And, if that weren't enough, that very same day Flea happened to wander past the courtyard at 11 avenue Le Play ... "
As I come to terms with the fact that I am soon to read the final book in the Elephant and Piggie books, I am also encouraged by the news that Mo Willems has much in store for his many present and future fans. To that end, I want to tell you about this early chapter book about friendship, a tale that is totally in keeping with what is at the very heart of his 25 books about Piggie and Gerald. We meet Diva at 11 avenue Le Play in Paris, in ' a grand old apartment building with a small gated courtyard in front'. She lives there along with many others, and is companion to the gardienne who cares for the building and its environs. Diva is a small dog, charged with patrolling the courtyard and welcoming or keeping visitors at bay. Flea, on the other hand, is a street cat happy with his role in life. Flea is a flaneur, a wanderer bent on seeing everything there is to see. When Flea walks past 11 avenue Le Play during one of his wanderings in the city, he is surprised by Diva's reticence to truly protect her courtyard by yelping and running off. That intrigues Flea and encourages many subsequent visits. 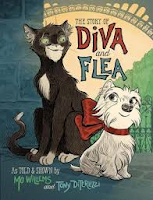 An unexpected gift from Flea to Diva, after inadvertently hurting her feelings, cements a growing friendship and leads to many adventures and discoveries for both. Plot twists are rampant and assure rapt attention to the action. A final 'wondrous thing' is just perfect! 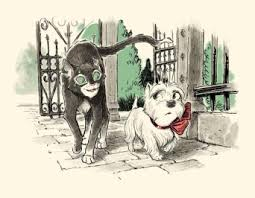 Tony DiTerlizzi places readers on the streets of Paris with his gorgeous accompanying artwork. The design is lovely, adding charm and tremendous appeal. Bits of French language describe the trajectory the story takes, in a series of acts and intermissions. The notes that both author and illustrator pen following the story add context and humor, when you might least expect it. Sure to be a favorite, I am adding it to my 'keepers' shelf! "The honey that we humans love to eat is made by honey bees. There are only eleven honey bee species in the world. None are native to North or South America. The species that is used most for producing honey came from Europe and North Africa, and has been taken to many other parts of the world by humans with a sweet tooth." I have mentioned the books in the Orca Footprints series previously, and they continue to be exemplary works of nonfiction for our children. In What's the Buzz we get a close-up look at bees and bee-keeping from Ms. Wilcox, a successful and ardent beekeeper herself. It is necessary for all of us to understand the very real importance of bees to our lives. The author uses four chapters to organize the information she wants to share with her audience. In the first chapter, we learn in clearly presented text what bees are, what they are not, and a whole lot more. Different types of bees live very different lives, live alone or in colonies, map routes so that they are successful at finding pollen and nectar, and are NOT all bumblebees! "BEE FACT: Some bees are called cuckoo bees. Like cuckoo birds, they lay their eggs in other bees' nests, so they don't have to do all the work of building a nest and feeding their young. There are almost 450 species of cuckoo bees in North America." The second chapter shows readers how bees work, the benefits to humans of their work and how we are putting up roadblocks to their success in doing their job. 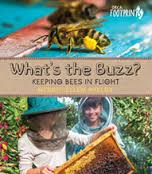 Chapter 3 spotlights life in the hive and how the bees work and live throughout the year. And they do work! In Chapter 4 the author wants her audience to carefully consider the work that must be done to ensure sustainability for these tiny creatures if we are to continue to reap the many benefits of their tireless work. In text that is accessible and informative, with fine photographs to up understanding, readers will find much to interest them. The photos are clearly captioned; some are from the author's personal gallery. In the All Abuzz sections, she shares personal stories that are conversational and enjoyable. In the BEE FACT boxes, she adds features fascinating facts for the wide variety of bees that inhabit the world. Personal and informative, you will come away from reading this book wanting to ensure that bees remain part of our environment and hoping to help make that happen. As Ms. Wilcox shares her concerns for their welfare, you cannot help but want to know more about protecting them now and in the future. The table of contents, list of resources, glossary and index are very helpful. "When I am done, Papa sends what I have written to one of the newspaper reporters he's been writing to. A few days later, there is a message on our answering machine. The message is from a lady reporter saying that she wants to print my story in the newspaper for everyone to read!" Sava is full of sadness. She is yearning for her mother, who has been sent away to Sunshine Correctional. She is being held there because she is a woman 'without papers'. Her papa is busy every night writing letters to important people, seeking help to get Mama home to her family. In weekly visits, the family catches up on all news. Those visits are never long enough, leaving Sava crying when they end, and dreaming of her mother's return. When a cassette arrives in the mail, Sava hears her mother's voice. It contains a song and a story, allowing Sava to imagine that her mother is right there beside her. It helps to ease the pain of separation that the family must endure. It is only the first of such tapes. Mama sends one each week, sad and happy stories; all meant to remind her young daughter of her abiding love. One night Sava joins her father at the table, sharing her story in writing. When a reporter asks to publish it, support for the family assures that Mama gets her day in court, and is released. Sava, who knows the power of the stories her mama shared, now realizes that words have tremendous power for bringing about change. This is a powerfully important story, beautifully told. It is illustrated in oils to emulate Haitian folk art. Its bold colors and emotional images allow readers to feel much of what Sava is herself feeling as the family deals with the longing and sadness that comes with separation. 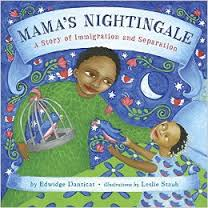 In an author's note, Ms. Danticat shares her own heartbreak at being separated because her parents, who had emigrated to the United States, didn't have the 'right papers' to send for their children. "As children in Haiti, my brother and I sometimes played writing games, making up passports, visas and other documents that might one day reunite us with our parents." She dedicates her book to those children who continue waiting. Being new to a country, a community, a classroom can be a struggle for most anyone. 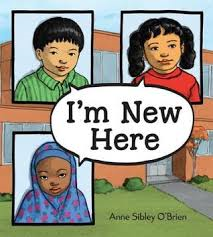 In this perceptive book about immigration, Anita Sibley O'Brien introduces us to three children: Maria from Guatemala, Jin from South Korea and Fatimah from Somalia. Each is presented to readers on a two page spread, focusing on just one of the challenges they face. Maria understood the language spoken at home where she and her friends talked all day long and played soccer together. English words are new and strange. Jin enjoyed writing at home, using his words to tell stories. New letters and sounds shut the door to his imagination and to his joy in writing. Fatimah felt comfort in being with her classmates at home. She can no longer find her place in a brand new and strange environment. With the passing of time each child begins to feel more confident and comfortable with language, with reading and writing, and with taking part in the work of the classroom. Each one has a special talent that is evident to all who read about them. Eventually, with the help of those who surround them, the three children find a 'home' in this new place. "Additionally, the reasons for and the losses incurred in leaving home countries add to the challenges of building a new life. Children like Jin may have left behind close family members. Other families, like Maria's and Fatimah's, may have left home not by choice but by force, fleeing from political persecution, violence, or war." Our understanding and support are sorely needed as they navigate their journeys. The artwork celebrates diversity and allows for emotions to be expressed and growth shown as days pass and acceptance becomes more evident. In order to help each of us build better bridges to understanding, she points her readers to www.imyourneighborbooks.org. Please visit to see what it has to offer. "She held on tight. "Papa. don't sell the manatee to Mr. Gomez, please." Silvio's smile disappeared. He looked astonished, as if wondering why his daughter was behaving like this. She was always so practical. They always agreed on everything. "But, Frog, he'll give us a good price," Silvio said, bewildered. "Come on, give it to me!" Manuela shook her head." Nicola Davies is a skilled writer and a passionate protector of animals living in the wild. She knows that the more informed we are about them and the more sympathetic to their plight, the more we will strive to make the world a better place for all living things. We can make a difference! The Heroes of the Wild novels are written for readers between 8 and 12 years of age. They are meant to raise awareness to the issues that threaten species around the world, and to encourage young people to become involved in making changes that need to be made. A remote Amazon village is the setting for this hopeful story. We meet Manuela and her father as they fish offshore. They have caught little and are discouraged when they happen to see a manatee surfacing nearby. To hunt and catch a manatee is a prized endeavor. It will ensure money for the family through the sale of the meat, and an elevation of respect for her fisherman father, Silvio. Once the manatee is dead and pulled into their canoe, they notice a calf nearby. They rescue it and take it to shore with them. It is a moment in time that changes everything Manuela has ever thought about the joy to be found in hunting the large mammal. With her arms around Airuwe, the wounded calf, she has a change of heart. She makes a promise to the calf, not realizing just how difficult it will be to keep it. 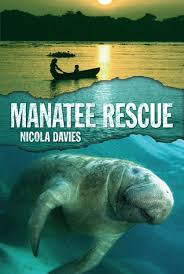 Having no experience to raise a wild animal, or previous understanding of the threats inherent in the natural world that surrounds her, Manuela becomes an advocate for the protection of the manatee. It is an unpopular stance until the people of her village have the opportunity to see the calf as it grows and flourishes under the watchful eyes of two young girls and an endlessly supportive grandmother. 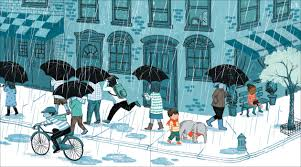 It may take a village to ensure its survival, but the story is proof positive to its young readers that they can have a voice and make a real difference. Readers who have an affinity for animals will find much to like about this series. Other titles available are Whale Boy, Walking the Bear, The Elephant Road and The Lion Who Stole My Arm. "The first step was to make the surface of the ice level. A tractor dragged a planer that shaved down the pits and grooves. The crew then shoveled away the shavings, washed the surface, and sprayed on a layer of fresh water. Finally, they dragged a barrel of hot water around the rink to give the ice its gleaming finish." I remember waiting for what seemed an endless time when I was a kid who loved skating. We would watch the workers come out and do all they could do to make the rink smoother for us as we spent afternoons skating at the community center and at the old Wheat City Arena. It was hard to be patient! In this welcome addition to the Great Idea series, Monica Kulling tells her young audience about a man who loved to be around machinery for his whole life. He helped keep the trucks and tractors running on the family farm in Utah, and then used those skills when he moved to California to work with his older brother George in his auto repair shop. The money he and his brother Lawrence earned was enough to send Frank to trade school. Upon graduation, the two brothers opened their own company, doing all types of work to help others. Adding an ice plant meant new customers and set Frank on a path to building a skating rink. All they needed to know for it to be successful was ice-making. Always looking for a better way to cut down the time needed to resurface the ice, Frank worked for nine years to refine the machine that is known to all hockey fans and players today as the Zamboni. 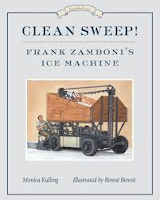 Reading this book assures that you know the 'rest of the story', and Frank's place in history as an inventor of the iconic machine that is a staple in all ice hockey arenas today. The artwork, done by Renne Benoit in watercolors and colored pencils, is detailed and engaging. They share a real sense of the time in which the Zambonis lived and worked. The machine can remove up to 60 cubic feet of ice in one pass. That's enough shavings to make 3, 661 snow cones! At the 2002 Olympic Winter Games in Salt Lake City, there were 20 Zamboni machines standing by to resurface the many ice rinks. the couch. In the cupboards. with her coat and boots. about it: she's left Jenny behind." When her mother sets her sights on Broadway and a life in America, Apple is goes to live with her grandmother. Apple is only 3. Nana is a fine caregiver, but to the now 14 year old adolescent, she is overprotective and controlling. So, when her mother returns, Apple's most ardent wish comes true. Now, she can live where she is supposed to live! Leaving Nana behind, Apple looks to having more independence and freedom. It doesn't take long for Apple to see what kind of parent her mother is, and to try to reconcile her dreams with the reality. Can she forgive her mother for leaving and having no contact for such a long time? Her mother says she wants her, and Apple takes a chance on her. 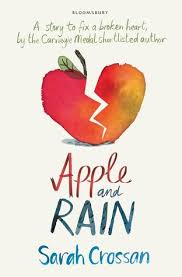 Turns out that her mother needs more care than Apple does, as does her stepsister Rain. Apple has a big heart, and wants to be needed. So, she does her very best to be what her mother needs. In trying to do so, she lies at school and does things that she knows are wrong. It is hard to watch it happen to such a caring young girl. It breaks the reader's heart, watching the inevitable happen despite all of Apple's best efforts. She loves unconditionally, she is brave and tougher than the life she now leads (if that is possible), and cheeky at times. Fending for herself and her sister is a huge task, not taken lightly in any way. The only real joy in her days since her mother's return comes when she is in English class writing poetry that allows her to express her truths and emotions. Like little pennies in a jar. And I made her perfect. And all that's left is disappointment. New hopes from heaping up." Heartbreaking, yet hopeful at its conclusion, it is brilliantly written and needs to be read by everyone! “Did you know, the man who invented the atomic bomb once said that keeping peace through deterrence was like keeping two scorpions in one bottle? You can picture that, right? They know they can't sting without getting stung. They can't kill without getting killed. And you'd think that would stop them." He gave the book another boot, and it flipped closed with a snick. "But it doesn't." Once again, I read a book while working on a jury that I would not likely have read! 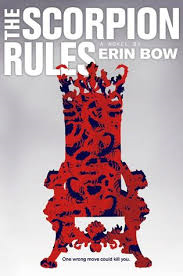 I know Erin Bow to be a talented and respected writer whose books have won accolades and awards galore. But, this was a dystopian novel that cautions us to think clearly about how our behaviors today in relation to the Earth are going to impact the future of the planet. I don't often read dystopian novels - and that is my 'bad'. It is a chilling look, full of unexpected twists, terrific characters and an incredibly well-constructed narrative! The effects of war and pandemics have laid waste to Earth as we know it today. Artificial Intelligence (AI) has determined that something be done with the humans who have caused such catastrophe. Talis, the AI ruler, decides that there is only one way to prevent war between nations - each nation on the planet will send a royal child as hostage to a controlled Precepture. Should any nation declare was, their hostage will be killed. Greta is the Duchess of Halifax and Crown Princess of the Pan Polar Confederacy, sent as a 5 year old to ensure peace for her country. At close to 18 and ready for release, she is seen as a leader among the other teenage hostages. She is well-educated, brilliant and prepared for death with dignity if the situation arises. Then, she meets Elian. Elian, a hostage from an enemy nation threatening war with Greta's country over water rights, is bent on creating chaos for their handlers, and for Talis. He is unruly, and brazen in his dealings with authority. His presence and actions put all of the hostages at risk. Watching what happens to Elian following any altercations with authority is disturbing to all of them. Greta's perceptions of her life as it has been lived take a sharp turn, allying her with Elian. Will the threat of war between their two nations change that alliance? Will humans continue to destroy Earth even when their own children are the price to be paid? Does the often disrespectful, and almost always humorous, Talis have a better perspective on successful leadership than proven world leaders? There are many questions to be considered by thoughtful and inspired readers. Are there any easy answers? Beautifully imagined and written, it is a book that deals with grand questions, violence, romance and dark humor and challenges readers to have an opinion. If you have not yet any other books by Erin Bow, this is sure to set you on a path to remedy that! the day I met a pretty girl. What made her so pretty? Many people today have very definite opinions as to what others choose to do with ink on their bodies. Just ask! Or don't - many speak freely and openly about their take on tattoos! 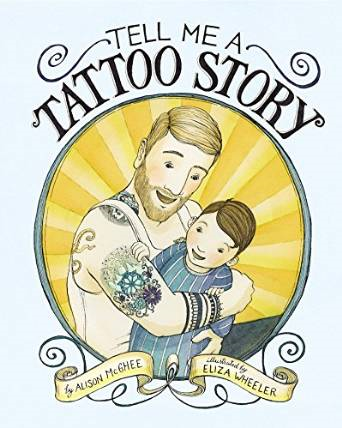 So, when a young boy, fascinated by his father's many tattoos, wants to hear their stories again, his father complies. Each one of them has a personal history and Dad has shared them often: a dragon for a favorite book, a memory of his father, a reminder of a pretty girl they both know well, a long trip while in the military, and finally, a tiny heart. They each choose that one as their favorite - and they have good reason for it to be so. You will have to read this fine story to understand why. Eliza Wheeler does a lovely job of moving readers from present to past, using India ink with dip pens and watercolor to create her touching family memories. They focus, as does the story, on family and the events that make each tattoo special. Past memories are infused with added color for a feeling of warmth and understanding. The endpapers are terrific, too! It is shiny and clear like glass." 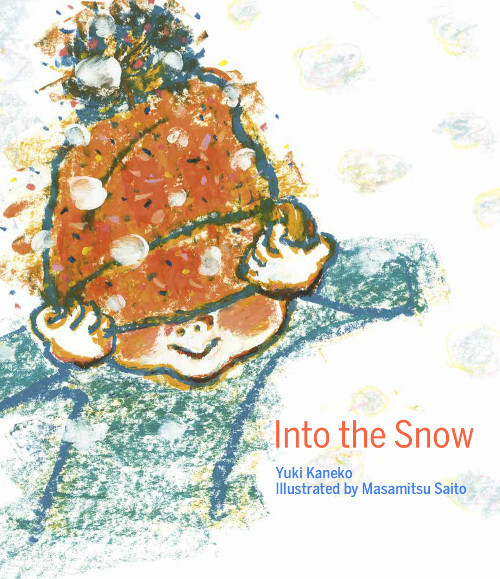 We all would do well to look at the world through the eyes of a child ... luckily for those who share Yuki Kaneko's new book, we can do just that! 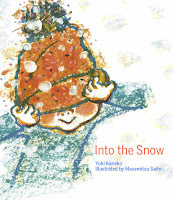 It is filled with the genuine delight felt by a young child when faced with a day in the snow. It is also narrated by that same child who awakens to a world of white and is filled with the joyful anticipation of spending the day in its brilliance. Mom is agreeable, so long as he is dressed warmly. Out he goes. He is our eyes to the glory of snow flurries, glassy icicles, a snow-covered hill, and full out fun as he slides toward a happy spill into softness and another giddy climb to the top. Just as he is feeling the cold, his mother comes to take him home. There, his tired body is energized by a cup of hot chocolate - the perfect ending for a day full of snowy goodness. Masamitsu Saito's stunning artwork is done in oil pastels, gouache, acrylics and colored pencil in a perfectly chosen palette of blue, green, orange and yellow. Textured and full of energy, young listeners are sure to feel the same excitement as the young narrator. The charming images are full of movement, allowing readers to feel the surge of power (and perhaps a little bit of the fear) as he zooms down the snowy hill. I love the independence given to this child to fully explore the exuberance he is feeling at the wonders that he sees right outside his back door. In southwestern Manitoba where our snow cover should be totally melted by the end of this 16C Sunday, we know that March teases with a promise of spring. We are not yet quite ready to believe that we have seen the last of winter. Should it snow again to blanket our world, I hope to be able to see it as joyously as this small child, recognizing the never-ending appeal it has for the young. "I was feeling more scared that ever before. (Even more than when I went to the big dog show with Grandma.) But Mom always says it is important to remember your manners, especially when you are greeting monsters visitors. So I said, 'Hello. I'm Orion.' And put out my hand ... "
Orion has some imagination! It's got him considering little and big things - in fact, many make him fearful. There is one thing in particular that frightens him the most. It's the dark! That's the night that everything changes! As Orion watches above through his skylight, he sees the Dark as it approaches, climbs through the window, and comes right inside. To say he is surprised and even more scared would be an understatement! As luck would have it, the Dark reaches out, reassures its new friend and invites Orion to go adventuring. 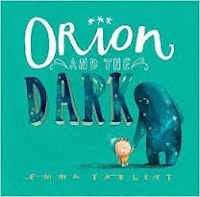 Orion shows the Dark of all the places where monsters live, and where the scary sounds are. In doing so, the two have some fun together. Finally, they make a visit to the scariest place of all - outside where the night is at its very darkest. Turns out that the dark is a magical place, made more so with Ms. Yarlett's humorous, detail-filled illustrations. The design is brilliant, and uses intriguing compositions to convey the fears, the imagination, and the growing friendship that occurs between Orion and his nighttime visitor. Done in mixed media and full of expression, it is sure to keep young readers entertained and curious. They may even be more content at bedtime! "The sneaky-spy porcupine-rescue plan did not seem as practical by day as it had when Max was falling asleep, but by the time he and Dad and Warren had arrived at Ace's Coffee Shop, Max was no longer thinking about porcupines anyway. Max was thinking about breakfast. "I'll have the County's Best Bacon and Pineapple Pancakes," said Max. What a great start to a new series by the talented and thoughtful Linda Urban! Max's parents are recently divorced. 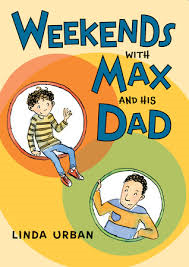 Max is spending weekends with his dad. He is not entirely happy with the new situation; he and his dad are trying to make the best of it. "It is very clean," said Max. He thought that sounded nicer that saying it was very white. The kitchen had a white counter and white tile floor and a white breakfast bar between it and the living room. The living room was white, too, except for a black TV and an orange armchair Max recognized from Grandma's house. The rest of the room was empty." Dad hasn't yet unpacked and still needs furniture. Max's bedroom is set up and welcoming for the most part. It will take some time to get used to this new situation. In the meantime, he and his dad share a spy escapade, much to Max's delight. That's only the first weekend. On subsequent visits, Max learns more about his father's new neighborhood, helps his dad continue to furnish his new living space, and organizes an 'open mike' night to showcase his father's talents. Realistic and humorous, readers looking for a new series of early chapter books as well as those dealing with a similar situation between parents are sure to enjoy this lively romp. Adjusting to his new circumstance is not always easy; but the adventurous weekends with his dad prove upbeat and hopeful. The realization for Max that he can enjoy both places as 'home' is a perfect way to end the first in a proposed set of three books. and it comes with rain. I hope you like umbrellas." I like that I am getting to share all those books that I read last month while visiting schools. I am only telling you about those that the kids loved, no matter which school I visited. As winter winds down and we look toward the warmth of spring, I always had Kevin Henkes' new book in my bag. I have been a great admirer of every one of his books. He has his finger on the pulse of young children ... their delight in the natural world and wanting to know more about it. It is his second book about waiting in recent months, and he shows little ones how that waiting is worth it! He lets them know that the snow will melt, the rains will spark growth and green everywhere we look. While they are listening, hid readers are also learning about the signs that signal the arrival of spring in such a warm and wonderful way. As well, they become cognizant of what we all know ... it is a not a linear progression from snow to no snow. Spring often changes its mind, and throws us a few curves. One day it's dry and sunny, the next the ground is covered with snow and the melting must begin all over again. 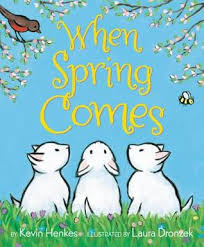 But, eventually spring bursts forth. Then, our waiting begins once more! Oh, so familiar for those of us who are lucky enough to experience the changing seasons every year. Laura Dronzek uses acrylics, in a varied palette, to welcome the new season with light and hope. She uses thick lines and simple shapes that warrant our full attention. Each turn of the page is a new opportunity to explore the wonder of nature. Don't miss the endpapers both front and back! They tease us with what we are so badly wishing for as winter winds down ... spring, then summer! climbs up. up, up into the trees. Luckily, he isn't afraid of heights. Mr. Postmouse takes his job seriously. On Monday morning he loads his wagon, and sets off to deliver the mail. From house to house he goes, leaving just exactly what his neighbors are expecting. 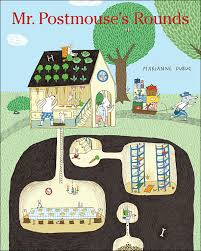 Each of them has their own unique dwelling, an invitation for little listeners to stop and take a long look at the many details shown in cross-section, both above and below ground. The text is simple, while also allowing for leaning about habitat and the postal system itself. 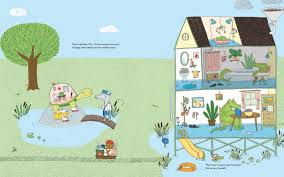 Children are sure to be intrigued with identifying the many neighbors visited as Mr. Postmouse makes his rounds. Observant listeners will note the stories that are taking place within the main tale. Each home has its own story to tell. There is an also an opportunity to let the imagination run wild trying to plot tales of their own as they carefully consider all that is going as they journey along the route. There are even some fairy tale characters for those who know their stories. A few of the neighbors get their comeuppance. This is an animal world you don't want your children or your early years students to miss. They are sure to miss some of the tiny tableaux on the first read - a perfect solution will be to revisit the dutiful postman as he makes his rounds once more. Beautifully designed, presented with panache, and uncluttered while often humorous, if this is your first book created by the talented Marianne Dubuc, it should not be your last. the way from the moon. There's a space exhibition at the museum! Otter Keeper takes Otter and Teddy to see it. With so much on exhibit, it's hard for Otter to know where to look first. 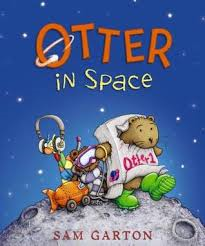 After much perusal, Otter is very happy to finally set eyes on the many unique activities set up to teach her about outer space. Videos, games, even a real moon rock. Who could ask for more? The gift shop forces a tough decision concerning the 'one' souvenir she can take home. The spaceship Otter chooses provides little incentive for a grand game of space travel. A moon rock is needed. But, how will she get one? After a lot of thought, a plan is hatched - a trip to the moon is sure to garner the rock they need. A list, then lunch, then an attempt to ensure that all list conditions are met, result in a lot of work for Otter and a lot of learning for Teddy. Training is problematic. Everyone is encouraged to help, and soon they are ready to launch! Did Otter Keeper forget to mention dinosaurs? That might be on the list for tomorrow's adventure. Perfectly played once again, Sam Garton! If you were to read this book without showing its brilliant artwork, your listeners would have no idea that the trip to the moon is of the imagination. They might even believe that Teddy is real (unless they have previous experience, after reading I Am Otter). Every single page is filled with brightly colored digital scenes that are humorous, playful and totally entertaining. It's sure to be a hit! Most koalas live on their own, so there isn't an official word for them in a group. Since they don't live too far from other koalas in the bush, their overlapping territories are called colonies or populations." "Animals have varied social lives, family systems, and living situations. 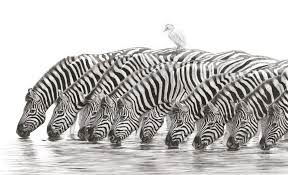 Some animals live together in large groups of thousands. 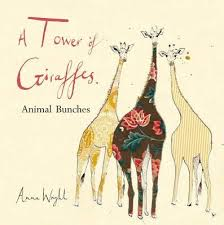 Others prefer to be alone but like to know that neighbors are nearby ... "
This would have been a glorious book had Ms. Wright only named the animal, their collective noun, and then created her accompanying illustrations 'done in ink and watercolor, then collaged with fabric and feathers.' She went that one step further: to educate, inform and astound. She begins with a gaggle of geese, letting us know that, in fact, they have two collective names. One is for when they are on the ground, the other for when they fly. Following that, she moves on to another noun. The whole book reads like a conversation, sharing short paragraphs that provide pertinent facts. Some are witty, all are informative without being overwhelming to the child reader. 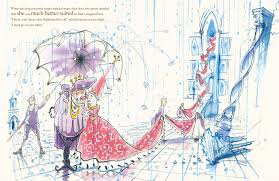 The heart of the book is the dazzling artwork. She captures the personalities of the animals with such warmth. Some are watercolors washing over the loose pen and ink lines, others use an unusual array of fabric and feathers to give life and charm. 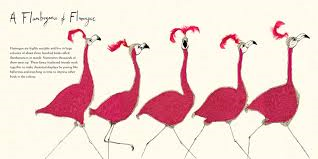 The pigs are perfection, the flamingos 'flamboyant', and the camels whimsical. Many of the animals will be familiar to readers. Their collective names are often totally appropriate to their natures. This is a terrific introduction for young readers into the world of collective nouns. It is sure to send some on a concentrated search to learn more. Perhaps it will also spark the creative juices for the artists in the audience! "Climbing is the most important job for a wild orangutan. Babies begin by climbing very small trees. Climbing can be very scary, and orangutan mothers wait patiently until their babies build up the courage to try. That is exactly what the foster mothers at the care center do, too." Just being able to look into the eyes of that tiny baby on the cover ups the interest for getting inside and learning as much as we can from this new book in the Wildlife Rescue series. The Orangutan Care Center and Quarantine in Borneo rescues orphaned baby orangutans, cares for them until they are ready to live on their own, while also training them to survive with the help of a dedicated staff of foster parents. Suzy Eszterhas needed special permission to work as a photographer within the center so that she might share her learning with us. 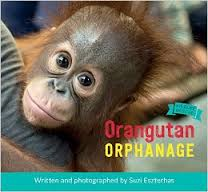 "On any given day, the care center may have over 300 orangutans. Eventually, they will be released back into the wild. Helping so many animals is a big operation. The center has an operating room, an X-ray room, a medical laboratory, a research library, living quarters for the orangutans and the veterinarians, and a private forest." 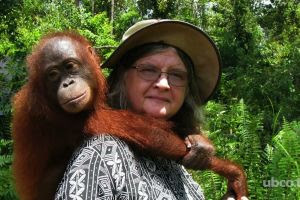 Doctor Birute Mary Galdikas is the hero who has spent her life getting to know as much as she can about the 'orang'. She braved all manner of danger to stay the course and study them in their home environment. Today, she is a tireless conservator of their habitat and an educator for the world. As we read, we learn about the threats to their existence. We come to know all the care center does to rescue, raise and return their many charges to a wild place where they will be safe. The written entries are short and chock full of information about the time and patience needed to raise these endearing charges. The many clear and close-up photos will have all readers mesmerized as they watch the daily routines of feeding, bathing, climbing, clinging to their caregivers, and always learning. It is a complicated and long-lasting process to ensure that the orangs will flourish once they are released to live on their own. There are a few places in Borneo and Sumatra where the public can visit them. This benefits all because the orangs generate income that provides jobs for villagers so that forests remain uncut, giving the orangs a safe place to live. Those visitors who see them in these places get an up-close opportunity to appreciate their demeanor and their intelligence. Back matter includes suggestions for helping wildlife, including orangutans, a question and answer with the author, a glossary, and index and a list of sources for the research done. Dr. Birute Galdikas with one of her beloved orangs! 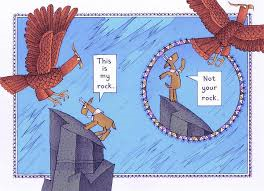 How often do you hear yourself say, 'this is mine'? If you live with little ones, you might hear it more often that you would like. But, I will bet that those are your words at times as well. Often, you might be less inclined to share what is yours with anyone else. That being said, the work that the young goat has undertaken to get to the top of a mountain makes him quite possessive of the spot he claims as his. He is really not keen on anyone else attempting to share it with him. As he watches other animals making their way toward him, he voices his displeasure at the fact that they are approaching 'his' spot. They think it looks like fun; he knows it is. He is not inclined to share any part of it! 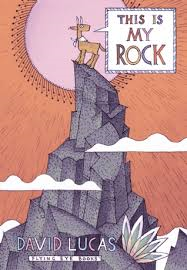 So, he hustles them back down the mountain with a repeated refrain: 'This is my rock.' Once they have departed, he enjoys the many pleasures of his high perch, until he isn't sure that he is as happy as he could be. He's cold, and he's lonely. Perhaps, he can make it better. Down the mountain he goes with hope in his heart. The surprise ending is a bit of a comeuppance! David Lucas does a terrific job of creating the patterned images that give his book such presence. I love the bright colors and the speech bubbles used to tell a simple story with a bit of a lesson. Little ones will soon be reading it independently, grumpily, and with understanding. for up to twenty hours a day. 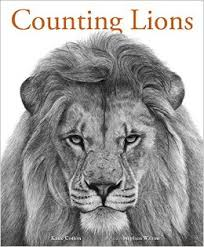 I will admit that it was hard to pay attention to the words scripted for this stunning book about endangered wildlife the first time I read it. Stephen Walton creates the nearly photographic quality images using charcoals. How is that possible? Readers are sure to experience an emotional response to each of the double-page spreads so carefully rendered that show the beauty and majesty of those animals chosen to alert us to the declining numbers to be found in the natural world. There are many reasons for this decline, as we know so well. Hunters want trophy kills, or souvenirs, or exotic pets ... they are willing to pay huge amounts of money to get what they want. Financial gain is a strong motivator; no thought is given to the importance of all animals in our world. Their changing environment is another cause for grave concern. The animals represented here can do nothing to protect themselves or their babies from such despicable behaviors. We, as a global community, must care enough to try to stop the slaughter and the incomprehensible loss of essential habitat. blink as the storm begins. so there will be no slippery belly-slide today. Endnotes provide additional paragraphs concerning each of the animals presented, including their protection status. Four are endangered, two are vulnerable. That is six of the ten! While it is cautionary, it does not scold. Katie Cotton gives voice to the grace of each species and the importance of their presence here. We need to heed her message and share this book! "Next, you need to know about pigs. Pigs lie in the mud all day and get bigger and BIGGER. That's their job. That's not your job. Don't lie in the mud. Mud is lovely. It smells like worms and toes and earwax, so you will really, really want to lie in the mud. But don't lie in the mud. If you DO lie in the mud ... "
I shared this clever book in a number of classrooms in the past few weeks. As expected, the kids thought it was funny and most enjoyable. I do, too. 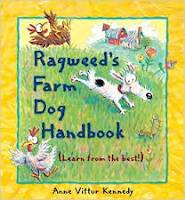 Ragweed has a lot of experience with farm work, and he wants to share it to make certain his handbook students know how best to become proficient at the assigned job. 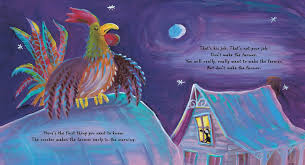 He begins at break of day, letting readers know that the rooster has a job to do. It's an important job and it is up to them to leave him to it. It could, however, happen that waking the farmer is something they might do and there would be a consequence if it were too early ... the farmer might throw a biscuit just to be sure they go away. Ragweed is willing to share sage advice, without need for compensation from the reader. But, the farmer's biscuits!!! He knows all of the best ways to appease the farmer into passing them out like candy. He is a dog who knows which side his bread is buttered on, and takes every opportunity to make himself the happy recipient of all treats available to him. It seems the farm dog's true job is to see how many biscuits he can down in a day. Ragweed's voice is conversational and free-wheeling. He wants his audience to glean from his advice all that they will need to know to be as successful as he is. He is consistently eager to please the farmer, the provider of all biscuits. Ms. Kennedy matches his energy in colorful, happy artwork that brilliantly ups the humor and pleasure of being with him as he teaches his lessons. His long snout, expressive eyes and endearing ways become more appealing with each turn of the page. By the time you finish reading, your listeners will be begging you to go back and start all over again. I don't think you will mind in the least - and you have the added benefit of knowing just exactly what to do should you ever consider being a farm dog as your chosen career. If laughter is the best medicine, this handbook has it in spades. Psst! - don't forget the biscuits! "I'm actually short for my age! Here's another book that was a huge success while I was reading for I Love to Read in local schools. One of the things I miss most since retiring is the daily sharing of the books I love with keen listeners who share that love of story. It was a real honor to see their responses to the stories I read. would like to share with the class." Television holds much more appeal in light of the assignment the little girl has been given. That is where her boredom comes to an abrupt halt. Sharing the living room with her, a huge polar makes his presence known. He convinces Sophie that not all polar bears are mean. Sophie is awestruck. Olafur offers a real opportunity for study. He is an expert guide; sharing his love of the Arctic environment, pointing out the many animals who live there, and basking in the beauty that surrounds the two of them. Their adventures are seemingly endless, until fatigue sets in and the two curl up on an ice floe for a much needed rest. As they sleep, the ice melts and threatens their safety. Sophie's newfound knowledge comes to the rescue, and all is well. One last surprise guarantees a report that has substance and is guided by a fascination with her new learning. Our final glimpse of Sophie fills my heart with joy! Imaginative and full of delight for all who share it, this is a book that renews Sophie's interest and engagement in her assigned report. 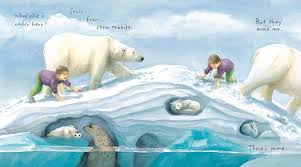 Using rich watercolors to create a world where Sophie can learn all that she needs to know in the glorious wonder of the Arctic landscape, we watch as the two explore the vast, wintry world. What better way can there be to learn about life there? Amazing! love a small, whispered ... "
With the turning of the calendar to March this morning, I feel sure that spring is just around the corner. Last year I waited until April (National Poetry Month) to share new books of poetry with you, and I think that I had a new one for every day of the month. That is not going to happen this year as I have not been hoarding them in order to do the same. Besides, I don't think you should wait that long to see what is new. on the tip of spring"
Imagine welcoming your class (and spring) with those eloquent words on your morning message board! 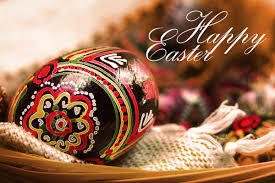 While there isn't one poem for every day of each season, there are forty-eight that begin in spring and follow the seasons until the next March 20, when the first poem is repeated. Brilliant! Share them until your students head home for the summer; then begin again in late summer with your new class. What a perfect way to be sure that you are making poetry a focus throughout the year! 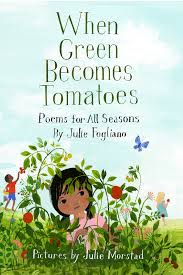 Julie Fogliano's warm, charming poems are each dated and placed in seasonal sections, allowing readers to contemplate the growth and change that happens as the year moves from spring forward. It is a celebration of the pleasures to be found in our natural world. There are tiny moments of drama. And many moments of pleasure and delight. I could go on and on sharing these beautiful word gems. I will make myself stop to tell you about Julie Morstad's graceful gouache and pencil crayon illustrations. They perfectly match every nuance of the words so carefully crafted by Ms. Fogliano. The other Julie has created a continuity throughout that allows readers to stroll from page to page with familiarity and wonder. If you can add just one book of poetry to your collection, be sure to give this stunning book a careful look. You will be amazed!